See what I did there? With the title? The “l’eau-down”? Get it? Let me just dodge the huge tumbleweed that’s rolling towards me and then I’ll get on with the post. Colognes! What does that word make you think of? Beautiful orange and lemon groves and crumbling old villas next to the mediterranean? Or a middle-aged Italian man with greased back hair trying to proposition you in the middle of a Milanese street? For me, it used to be the latter, but I am gradually coming around to the joys of a light, fresh cologne. A cologne, for those of you who aren’t sure, is a perfume with a very low percentage of actual perfume oil or essential oil – it’s lighter, less intense and it doesn’t last for anywhere near as long as an eau de toilette or parfum. It’s usually far cheaper per ml than the more concentrated versions of the scent and usually comes in larger quantities so that you can spritz or splash away to your heart’s content. It’s not only the concentration of the scent that’s different to your regular perfume, though; the top notes are typically fresh and citrussy (Bergamot, Neroli, Lemon, Mandarin, Lime, Grapefruit), often offset by Lavender, Thyme and Petitgrain. The classic version would have to be the Original Eau de Cologne, 4711, but there are hundreds available now, all of them different, lots of them extraordinarily beautiful. I’ve gathered together some of my favourites – a few of them aren’t colognes, strictly speaking, and a couple aren’t labelled as one but should be! I think that there’s a degree of snobbery towards colognes, but I’d point you firmly in the direction of Tom Ford’s Neroli Portofino: all of the notes of a classic cologne, and has even been relaunched in a “splash” bottle. 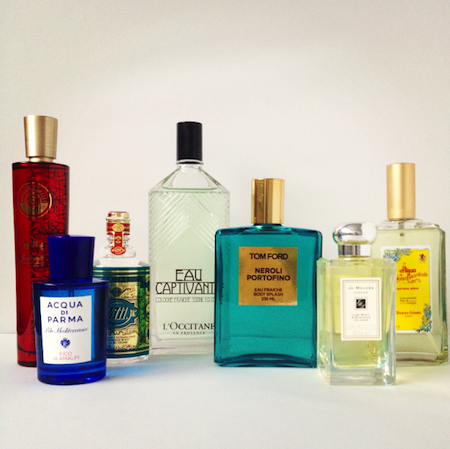 So there – colognes are most definitely stylish! 2) Acqua di Parma Fico di Amalfi. I reviewed this recently (read the Fico di Amalfi Review here) and I absolutely adore the “fig” twist on the traditional cologne scent. It’s stunning. Out of stock at John Lewis, but Escentual.com have it with free delivery. Most definitely unisex, this one – read the review! 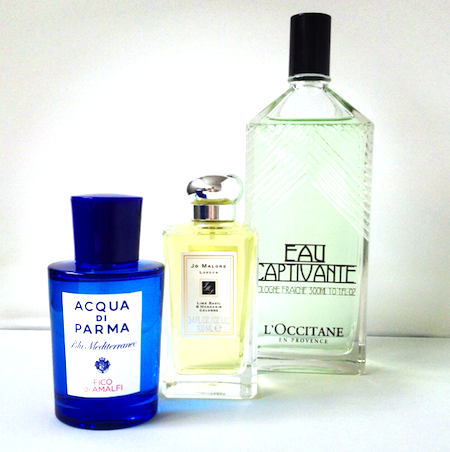 3) 4711 – the original eau de cologne. And it really is. This holds a place in many a heart – it’s pretty old-school, but massively popular! £17 from Escentual.com Again, definitely unisex. 7) Agua de Colonia Concentrada – reviewed here recently. 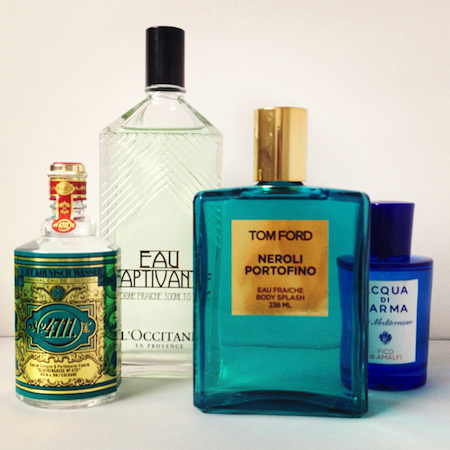 (Told you I had a cologne fixation!) Spicy, herby, fruity. Cologne with added fire, would be the best description of this one! It comes in a bright yellow box (you can just see it peeping out in the photograph above) and the bottle reminds me of some kind of exotic tequila or rum bottle. Nice! Find this one on Carter and Bond. That’s all of my tried-and-testeds, but there’s a little extra mention. The Verde d’Arancia from Monotheme’s Library of Citruses (Il Libro Degli Agrumi) is just the purest orange scent in a bottle. (Far left in photograph above.) If you puréed an orange, peel, pith and all, and jammed it into a pot, it would smell like this. It’s happy, summery and vibrant. It’s not a cologne, but whilst we’re on citrus notes, I thought I’d drop this one in! £22.50 from the recently launched M&S Beauty Paradise! How do you feel about colognes now? Tempted? To finish this marathon post, I just wanted to tell you a few ways that you can use cologne – feel free to add your own suggestions. Firstly, they make quite wonderful emergency room sprays. There’s something about the fruity, sharp notes that make musty rooms smell fresh again. Ditto for laundry water or for spritzing bed linen and towels. You can add a splash of cologne to bathwater for a light scent that doesn’t leave any oily residue, and you can use the cologne as a body splash when the weather’s hot. Signing off now, as I may go insane if I write the word Cologne one more time! 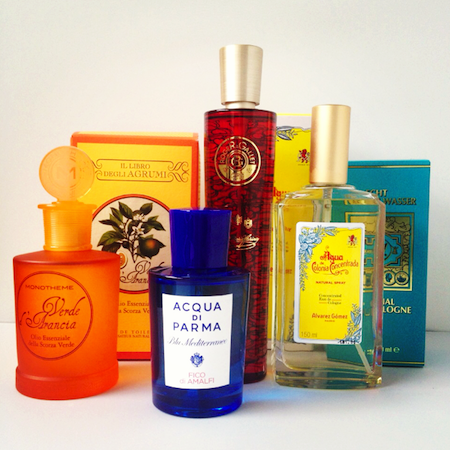 For more fragrance reviews, click here! Previous Post Summer Dressing: Let the Sales Madness Begin!